Four-month-old Sarah Galloway died this date, April 11th, in 1848 and was buried at Bethel Burying Ground. Four-month-old Sarah Galloway died this date, April 11th, in 1848 of Convulsions and was buried at Bethel Burying Ground. Sarah was the daughter of Benjamin (~47 y/o) and Rebecca (~43) Galloway. They had three other children Matilda (~10), Mary (~8) and Isabella (~5). The family lost another daughter, 6-year-old Rebecca, on December 1, 1847. 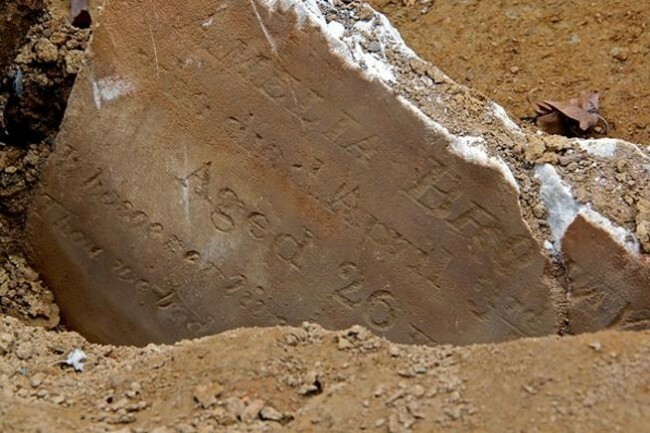 She died of a brain fever, possibly Meningitis and was buried at Bethel Burying Ground. There was also a twenty-four-year-old male named James Galloway in the household whose relationship to the family is unknown. He was employed as a waiter in 1847 and a boxman in 1850, according to census records. The Galloway family rented a room or two at 10 Bonsall Street, later known as Rodman Street. They lived on one of the floors of a three-story house with stairs up in a piazza or veranda, similar to the photo below. The indoor hallways would connect to the outdoor landings and the flight of stairs to the next floor. There was no indoor water service in the house on Bonsall. Water was obtained from the hydrant (spigot) in the backyard of the house near the privies. The water for drinking, cooking, laundry, and washing had to be carried upstairs. A young woman, “Trilby,” standing next to an outdoor hydrant. Ms. Galloway worked as a laundress and would have been very familiar with the backyard water supply. Mr. Galloway was employed as a silk dryer, a very skilled profession, rare for an African American to hold. The work of a silk dryer was labor-intensive and one of precision. The dryer’s duties included cleaning the raw silk, bleaching it, adding chemicals to fix the color, dyeing, and drying. To clean raw silk, the dryer hung the silk on a long pole and immersed them in a large vat of boiling soapy water. He or she then would rinse the silk clean in a running river. The poles would be carried back to the factory and the process would be repeated and the desired hue achieved. The poles then would be carried back down to the river to be rinsed for the second time and, once again, carried back to the factory and hung up to dry. Benjamin and Rebecca Galloway lived long lives with their married children and grandchildren residing with them in a house on Lombard Street, according to the 1870 Federal Census. Benjamin died on February 2, 1880, at the age of seventy-eight of Stomach Cancer. He was still employed in the silk manufacturing and cleaning business. Ms. Galloway was still alive at the time of her husband’s death. Her death certificate isn’t on file. ← Thirty-eight-year-old William Stevens died this date, April 5th, in 1848 and was buried at Bethel Burying Ground.